A Conspiracy of Truths opens with a farce of a trial, a wandering storyteller called Chant accused of witchcraft in the country of Nuryevet. Chant does not exactly take this charge seriously, and he has never been good at keeping his mouth shut. So naturally, things snowball out of control until he ends up an accused spy pinballing back and forth between the jurisdictions of the country’s leaders. To all appearances, he is a helpless old man without friends or resources. But stories have power, and Chant is full of stories. I personally feel, when surveying the current fantasy landscape, that so many awesome books are being published right now. And yet, not enough of them are funny! We’re in a moment of political fantasy and emotional anguish, with the feels – o – meter turned up to 500%. Which isn’t really a complaint because I tend to like exactly those books, just that I would also like a funny book or two to balance them out. So I am happy to say that Alexandra Rowland’s A Conspiracy of Truths (2018, Saga Press) is a breath of fresh air. Okay, fine, there are also plenty of political shenanigans and some emotional anguish here. There are lots of stories and reflections on storytelling and human nature. But Rowland pulls off a tricky narration where her main character claims that he is not invested in the people around him and is very amusingly petty about the things that happen to him. And yet we start to see that this ironic air is in some ways a story he is telling himself. It is perhaps Chant’s curse to start caring. If you are a plot-driven reader, or someone who gets impatient when characters are passive, this is probably not a book for you. I even started to wish that Chant would do something, and I certainly tend to like books on the “people sit around and drink tea and talk” end of the spectrum. However, I also guessed that he was in effect setting up a cascade of events that would happen all at once, and so I was willing to wait around and see what happened. And again, the light and humorous tone helped make even this part of the book a pleasure to read. Chant himself is an interesting character–Chant is a title rather than a name. He has given up the name he was born with in order to become a Chant. But Chants are not simply wandering storytellers. They also influence events and tend to be there when moments of historical significance are about to happen. Without exactly lying, Chant is certainly not telling the entire truth when he plays up how much of a decrepit old man he is. 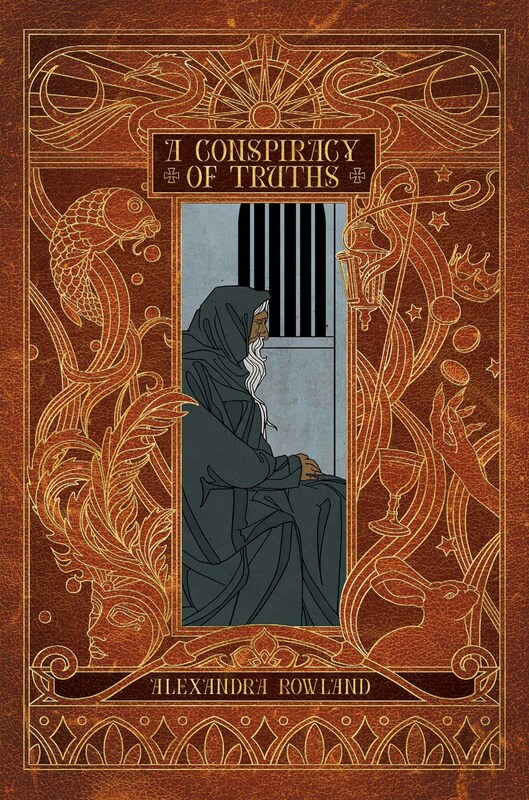 I will say that A Conspiracy of Truths suffers from a similar problem as The Goblin Emperor: the women here are fascinating and I have a sense of their off-screen lives being rich and wonderful, but the actual plot of the story is very focused on men. Ultimately, I really enjoyed the book and didn’t see this as a deal-breaker, but I do wish for more books in this vein that are about women’s stories. This has been a bit of a hard book to review, especially in a hurry and several weeks after I actually read it, because it’s operating on different levels. There’s Chant’s story about what happened, which he’s telling. There’s the political upheaval in Nuryevet. There’s Chant’s apprentice and friend Ylfing, who is always falling in love. There are all of the stories they tell to other people and to each other. There are big questions about complicity and the limits of being a good person in a morally corrupt system. This is a lot to juggle, but Rowland does it well. Ylfing’s book, A Choir of Lies, is coming out soon and I will certainly be planning to read it! Yes, this book WAS a bit slow for my tastes! I still enjoyed it, but it felt kind of indulgently overlong, and I thought a few of the machinations could have been trimmed down. But I still liked the characters, and I’m tentatively curious about Ylfing’s book? Ironic detachment, even when it’s obviously a front, isn’t so much my thing, and I think Ylfing will be a narrator better suited to my tastes. This does sound like it would be up my alley; anything humourous, and particularly unreliable narrators and fools who have hidden schemes are sure to catch my interest. That’s an interesting point you make about Goblin Emperor; we’re doing it in book club this month, and I’ll be sure to bring that up!